Pixelator is an unauthorized on-going video art performance collaboration with the New York City Metropolitan Transit Authority, CBS Outdoor, and its selected artists. Since 2003, the MTA has made available for exhibition purposes 80 LED screens located at subway entrances across New York City. Unfortunately, the high cost of exhibiting (an estimated $274,000 per month per screen) prevents most artists from having access to these facilities. While the MTA’s effort to create more opportunities for video art exhibition in public spaces is to be commended, selected works remain wholly fixated on commercial goods and media conglomerate events, a short-sighted curatorial choice that regrettably ignores the full potential of these promising exhibition spaces. 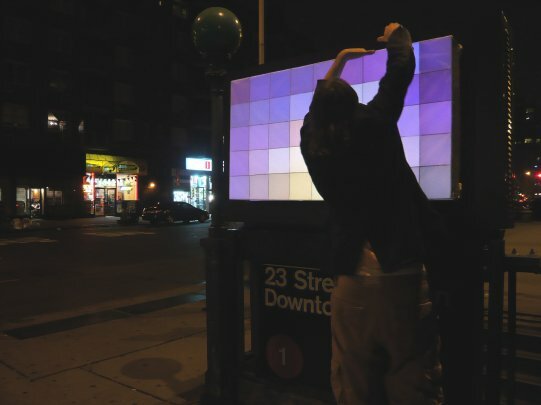 In an attempt to broaden the scope of MTA’s video art series, Pixelator takes video pieces currently on display and diffuses them into a pleasant array of 45 blinking, color-changing squares. Since the project is an anonymous collaboration, the resulting video is almost entirely unplanned and unanticipated, with the original artists helping to create new works of art without any knowledge of their participation. Step 1: Measure your target. In NYC, video billboards are 27.5" x 49.5". Make sure your target is the same size before using these numbers. Step 3: Cut the foamboard. Step 4: Interlock the pieces. Step 5: Tape the sides. Step 6: Cut and glue the diffusion gel. Step 7: On the back, generously apply Stik Tak to the corners and top edge. Step 8: Attach to video billboard and enjoy.